Laughing Squid turns 10 this year, so we’re throwing a big party to celebrate our decade long experiment in underground art, culture and technology. 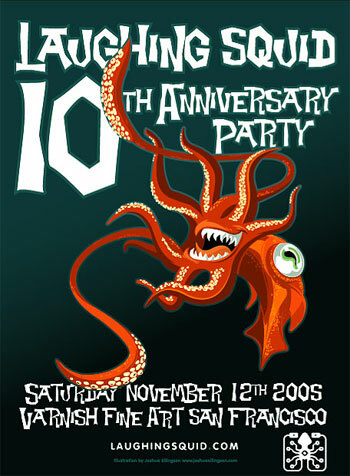 We will be giving out free Laughing Squid 10th Anniversary Posters created by Joshua Ellingson. The gallery show that will be up on the walls at Varnish during the event is Gale Hart’s “Why Not Eat Your Pet”. Check out our blog for event updates.